The Kessler KillShock is used to remove camera vibration when shooting from vehicles like cars, boats, ATVs by isolating shock away from the camera via a set of shock modules. The isolator is based on a set of 8 modules with each containing 3 shock cables per module as it allows for proper weight distribution around the entire surface of the isolator and not just the corners. 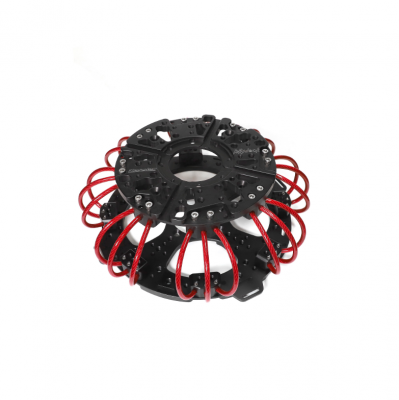 The KillShock comes standard with a set of 8 Medium Duty (Red) shock modules pre-installed, but it works with 8, 6, 4 or 3 modules to fine tune for your payload requirements. There are also two additional options for shock modules available, Light Duty (Blue) and Heavy Duty (Black), which can be combined to create the perfect blend of isolation. The KillShock is compatible with a variety of mounting options and it can even be used in inversion mode with an optional add-on kit. The KillShock top plate features numerous mounting options: Built-in Mitchell Mount | 100mm bowl insert | Cheeseplate Insert | Freefly's Toad in the Hole | MoVI XL to Mitchell adapter | DJI's Ronin 2 Universal Mount. | Kessler HD Angle Plate - Allows for leveling the camera when using the KillShock in Hostess Tray Mode (vertically mounted) or when hard mounting a camera directly. | Plus numerous 3/8"-16 and 1/4"-20 tapped holes for mounting accessories like handles as well as tethering and other needs. The bottom plate features 1” tether strap points which extend away from the base allowing for easy attachment of ratchet straps and safety wire. It also has a similar center mounting pattern as the top plate so you can mount the KillShock with the Kessler Mitchell Boss adapter with Castle Nut, Center Cheese-plate or via the 100mm ball mount when combined with the center cheese-plate. The 3/8-16 and 1/4-20 tapped and through holes on the bottom plate allows the mounting of support arms, baby pin to 3/8-16, speed rail clamps, mounting hardware, etc. to mount the KillShock in hundreds of different ways. KillShock features interchangeable shock modules that can be set up as 3, 4, 6 or 8 modules. These modules come in three strengths: Light (DSLR and hardmounting), Standard (shooting with MoVI Pro or Ronin with RED, C300, etc.) and Heavy duty (MoVI XL, Ronin 2 with Red, Alexa Mini, or Phantom with zoom or heavy cine primes). Various strength shock Modules can be combined to achieve the exact payload displacement and strength you needed. Kessler HD Angle Plate with swivel (for leveling camera with rotational adjustments) or when using KillShock mounted to door in Hostess Tray mode.